Serve your offerings in style with this Genpak LAM05-3L Elite 5 oz. black laminated foam bowl. The non-absorbent foam construction prevents any liquids from leaking through. 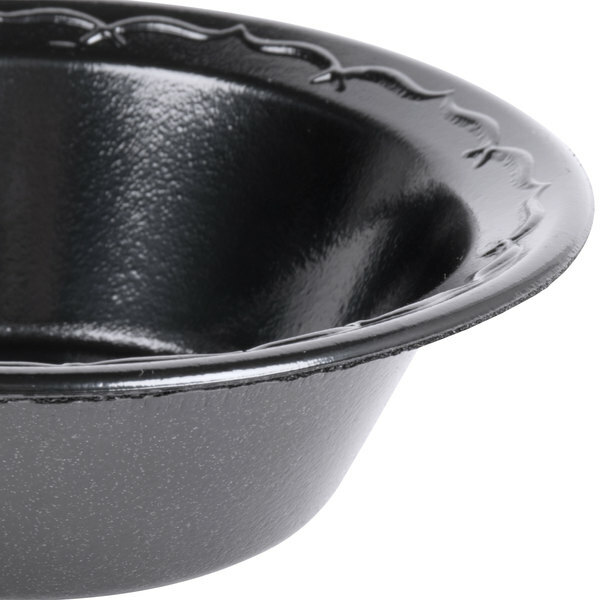 To avoid unwanted messes and spills, this bowl features deep shoulders and a wide rim, helping to keep food contained. 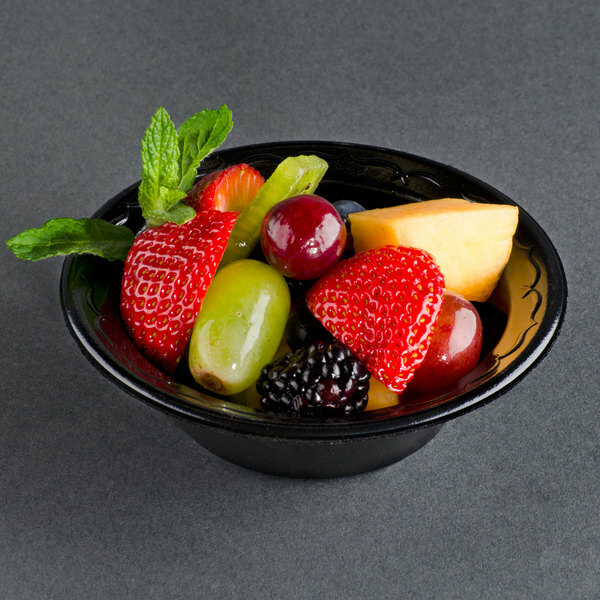 Plus, unlike non-laminated foam products, this glossy bowl boasts a surface that is cut resistant for added durability. With the ability to hold cold and hot foods, this foam bowl is great for serving guests at your picnic, party, or catered event! This bowl's inverted structure, textured ledge, and lightweight design provide easy product separation, enabling you to quickly distribute each bowl and keep your buffet lines moving! 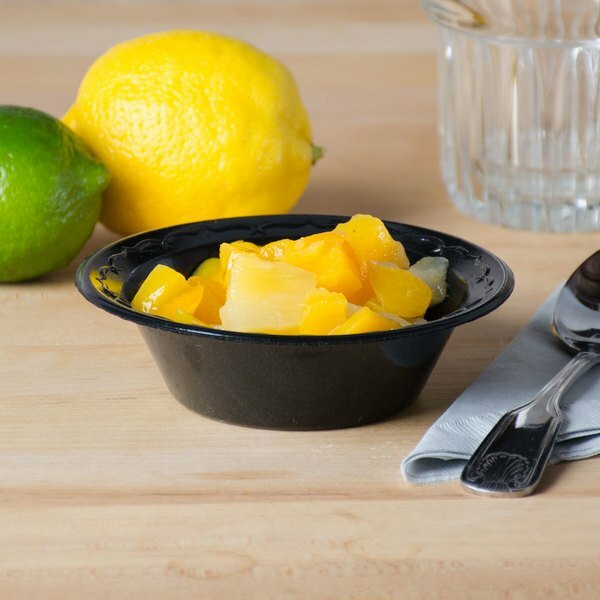 Made of laminated foamed polystyrene, this bowl is also insulated to reduce heat transfer, and keep cold dishes at the proper serving temperature throughout an entire meal. Once all the food is gone, enjoy a quick and effortless clean-up thanks to its convenient disposability. 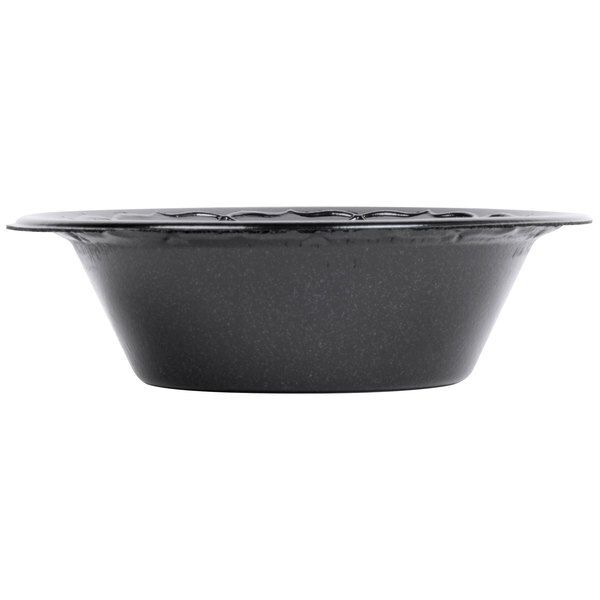 This Genpak 5 ounce laminated black bowl is a great disposable. It is lightweight, yet durable. Great to serve fruit salad, applesauce or cottage cheese in on our buffets. Love the black, very sturdy. Work great for hot and cold items. I would highly recommend for any business. We use for a wide variety of food. 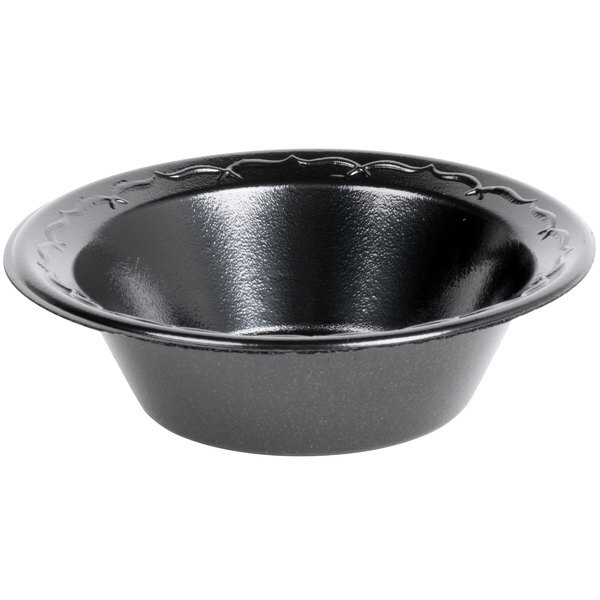 Great 5 ounce bowls for a disposable laminated foam bowl. They are nice for coleslaw and jello salads. They're attractive for a disposable. 1000 per case. The Genpak Elite 5 oz. foam bowls are perfect for our Grits Bar and our Shrimp and Grits. They are elegant looking and perfect for any occasion. I use these daily in my restaurant. Love the look--much nicer presentation than styro cups, etc.--and they are extremely sturdy--I order often and have had no complaints. These are nice bowls for small side salads! They are strong and disposable! The perfect items to have for small get togethers where cleaning up is the last priority!! These bowls are ideal for a small dessert. The laminated foam is sturdy and won't leave burn marks or holes when heated. Oh, they look good too. This is a very nice small dessert bowl for like ice small ice cream sundeas or pudding. The bowl is very nice quality. I would recommend them.